Technical Pro is known to build professional gear that audio professionals and audiophiles turn to for all of their sound needs. Our new line of Bluetooth Compatible equipment is quickly becoming the bench mark for all others to follow. With its sleek design and incredible range the BLUEDECK Bluetooth® Audio Receiver is one of the hottest units in the market. It’s designed to fit in the tightest of spaces and of course built with the same long lasting design that you can expect from the engineers at Technical Pro. Bluetooth has changed the world we live in. You are no longer constrained by wires and cables and can move about freely all while controlling the audio from the palm of your hand. long lasting design that you can expect from the engineers at Technical Pro. Technology is always changing, but when you have got so much money already invested in your gear is hard to keep up. The BLUEDECK gives you the ability to turn your setup into a Bluetooth capable powerhouse, allowing you to take advantage of the newest technology without breaking your budget. 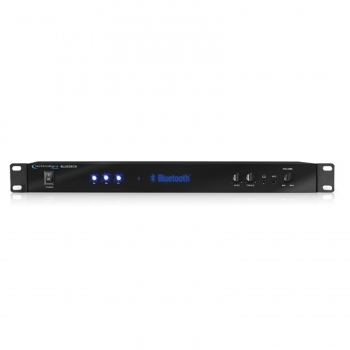 Simply connect the outputs from the BLUEDECK to the inputs on your current system and just like that your system is now Bluetooth capable. Wirelessly connect a cell phone, laptop or any other Bluetooth device to the BLUEDECK and begin to play that audio through your system. The BLUEDECK's small size all but guarantees it will easily fit into your current setup.